The twins are going on 2 years old and while our days are CRAZY, we have been getting actual, real, uninterrupted sleep! We won't be stocking on a permanent basis, but I have enjoyed creating this stocking of soakers for you! These soakers are ready to ship, and all soakers will ship with Eucalan wool wash samples. 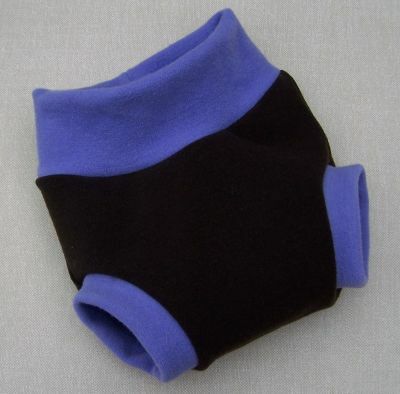 Woollybottoms interlock soakers are made entirely from a blend of Organic 95% merino wool, and 5 % lycra for stretch. This fabric is the same fabric that we use on our waistbands and thighs on our hybrid soakers. We recommend not sizing up as these covers pack a lot of stretch. Weights listed are intended as a general guide. Please use the measurements as the best guide for fit. Our interlock is hand dyed in small batches with low impact, non-toxic dyes and heat set with vinegar. Hand washing is recommended, but our interlock covers may safely be machine washed on a cool, gentle cycle. Lay flat to dry. What is the difference between our hybrids and the organic interlock? The hybrids are unique and change every time we list them since they are made from recycled sweaters. Prints and textures are fun! They will fit a bit bulkier because the fibers are "fluffier". They may not fit as well under clothing. The interlock will fit more trimly under clothing. It is a little more rough and tumble since the yarn used is very small and knit very tightly. It is more resistant to snags. Colors are limited. Interlock can be safely washed on occasion on a cool, gentle cycle. We do not recommend machine washing hybrid pieces. Both kinds of covers will equally work well for day or night use. Because our interlock is a very tightly knit fabric (it is specially milled to be the thickest interlock on the market! ), the extra wetzone as seen in other brands is truly not needed. You will see and feel the difference right away.